Security State Bank is the building on the corner. 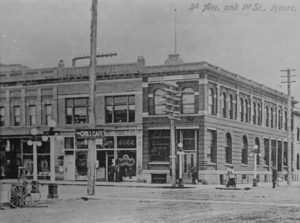 It was located on the southeast corner of First Street and Third Avenue and later razed. In war related news, Camp Lewis in Washington state was preparing for a big horse show to demonstrate the capabilities of the army’s horses and mules. The Senate was getting ready to debate a bill that would cease the production of beer; it was soundly opposed by US Food Administrator Herbert Hoover. The thought was to save the grains and fruits used in the production of beer, wine, whiskey, brandy and gin for the war effort, but Hoover stated that the benefits of putting the nation in what seems to amount to a mini-Prohibition would far outweigh any food savings in the effort. Remember, while Montana voters had approved a ballot initiative for Prohibition, along with a few others, the nation was still wet. So, don’t mess with their beer! “We expect a crisis and we want to be ready to meet it. For this reason it was considered advisable to ascertain all surplus stocks on hand, whether held by the merchant, baker or housewife. This move was widely misunderstood, but the action was taken that we might know where available flour was to be had to that we could get it quickly when the necessity arose. Another article stated a big increase in wheat crops for the 1918 growing season, but local meteorologist C. W. Ling reported the driest May on record. He reported .13 inches of rain for May 2018, with the highest temperature being May 3 at 85 degrees and the lowest on May 26 at 25 degrees. The last killing frost in May happened on the 29th. “Miss Grace Easter, principal of the Havre high school entertained the members of the senior class on Saturday evening at her home on Third Avenue. At the close of a delightful evening the class presented Miss Easter with a beautiful gold wrist watch with the class of 1918 seal and her initials, as a slight token for their appreciation of her efforts on their behalf.